It feels weird to introduce the options for vegetarian restaurants in Hoi An after a blog post with recipe of 4-kilo smoked beef. But then again we thought the beginning of the year would be the perfect time to try to lead a healthy lifestyle and explore something different. Among all the culinary varieties that Hoi An has to offer, our guests are often quite interested in the many vegetarian places around town. We cannot write a better guide for you than our friends over at Hoi An Now, so here it is, all the amazing vegetarian options for your taste buds. In general Vietnam is a great place for vegetarians. Vietnamese cuisine offers many meat-free options and, in Hoi An, most international menus have a vegetarian section. Indian, Mexican, Japanese and Italian are favored by local vegetarians in particular but there are several dedicated vegetarian restaurants as well that are so good that vegetarians and omnivores visit in equal measure. From strictly vegan to mouth-watering cream and cheese sauces; from soups and steaming hotpots to deep-fried delights and incomparable desserts – and it’s all often for a fraction of the prices elsewhere. Don’t make the mistake of thinking that if you’re not a vegetarian then dedicated veggie restaurants aren’t for you! Roughly-hewn wooden furniture and wafting ‘Om’ mantras humming in the air immediately soothe the soul. The whole space is a design triumph, more befitting New York or Paris in a funky Buddhist way. With mains around 40,000 VND Am is the classiest, cheap setting in town. Mushrooms, tofu, salads, soups and hotpot dishes with ever so fresh ingredients are deftly spiced revealing intriguing combinations of flavor and texture. For many, Hoi An’s premier Vegetarian Restaurant. Annen’s laid-back outdoor style invites you to relax. Incredibly this comfortable setting has nothing on the menu over 45,000 VND! Standouts include the refreshing and light, Sup An Niem (Annen soup) and Cha Gio – incredibly moreish, fried spring rolls. The ubiquitous stir-fried noodles with vegetables and tofu is one of the tastiest anywhere in Vietnam – a colorful concoction of fresh, crunchy carrots, green beans, red cabbage, onion, bean sprouts and button mushrooms packed together with lightly crisped tofu and soft noodles laced with soy sauce. Vegan restaurant, Co Dam, is one of the cheapest in Hoi An. No names or menus, just choose from the six or so dishes of the day. Favored by Vietnamese locals not just for price (between 15,000 and 30,000 VND!) but also for authenticity. Many dishes resemble meat counterparts mirroring pork belly or chicken legs for example, in time-honored Vietnamese tradition. The setting may be basic but this is the real taste of Vietnam – piquant and moderately spicy. 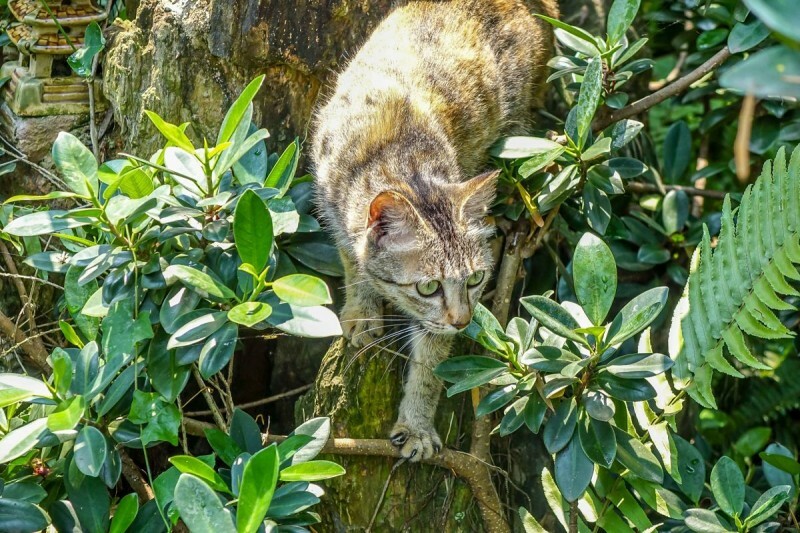 You share Jack’s Cafe with 70+ rescued cats who roam freely over an exquisite garden courtyard and even through ‘runs’ in the kitchen and other indoor areas. With so many cats its ideal for children. The menu changes regularly running from snacks like guacamole on rye, egg curry salad and crispy tofu and coleslaw wrap. Great coffee and fruit juices. Small donation requested for cat welfare center. See http://www.vietnamcatwelfare.org/jacks-cat-cafe/ for availablity. In addition to local fare the menu has a large selection of Indian and International cuisine and plenty of healthy juices. The Karma Waters’ Veggie Burger’s one of the best-value meals in Hoi An and many seasoned expats rate Karma Waters among their favorites. Minh Hien with its indoor, outdoor feel is a nifty place to ogle passers-by on Tran Cao Van. Delicate pumpkin slices, firm yet succulent; pork-free Cau Lau noodles swimming alongside fresh mint, salad vegetables and mushrooms; and sweet and sour straw mushrooms, moderately fired up with chili set the scene. Vegetarian or otherwise, Minh Hien’s place as one of Hoi An’s leading value-for-money restaurants, is assured. A kissing cousin of the original Minh Hien on Tran Cao Van – this inexpensive vegetarian restaurant is great value for money. The lightly curried pumpkin and the wonton soups are favorites and the very spicy salad of green banana, mushroom, various greens, bean sprouts and chili is a knockout – literally. At Minh Hien 2 the owners’ gentle spirituality permeates the service and is part of a package that’ll make you want to return. Frenchman Julien Prete brings European class to Nomad Cafe with scrumptious salads drizzled with zesty dressings and pastas with unique, homemade sauces. Other parts of the menu change weekly following Mediterranean or East Asian traditions always retaining Julien’s trademark flair. Perhaps Hoi An’s closest to urban chic cafe foodwise. From Thai green curry to chapazza and focaccia; from empanadillas stuffed with fetta and mixed salad to penne with roast vegetables. Unique juice blends also highly recommended. Two 4-course set-menus lead the way (exceptional value starting from 70,000 VND). P & B is at the yummy, some might say naughty, end of vegetarian cuisine. Think deep-fried okra, spaghetti with a cream and mushroom sauce, cheese garnishes and lightly seasoned, fried potato medallions. Stay away if in a hurry but, if you have the time, it’s one of the best value-for-money feasts going. So, what’s keeping you? For us personally, Aubergine49 is the answer to everything. And it is so true, Aubergine49 is our go-to place for any major celebrations, having friends in town, recommending to guests for a nice treat, or even just for a ‘we haven’t been to Aubergine for a few weeks, let’s go’ kind of day. We love Aubergine not only for its consistency in producing a fine-dining experience, the amazing quality of food that you can only find at Michelin-rated restaurants in Europe, the attention to details in every little thing, and of course, the kindness and passion of the man behind it all: Chef Thinh. You probably hear us talking about ‘our friend who owns this restaurant,’ ‘our friend who runs this bar’ all the times and wonder if we only select F&B people to befriend. The truth is that we love food so much that if we like a restaurant, we would go there so often that before we know it, we have become friends with the owner/chef. The same case went for Aubergine49. I always called to book directly with chef Thinh (a friend of a friend), and after the 5th or 6th time dining there, the mysterious chef came out when the kitchen closed to say hi and we all found ourselves talking passionately about food and life and everything in between for hours until all the lights on the street have disappeared. After ten years honing his culinary skills under some of the world’s leading chefs such as Paul Gayler of London’s The Lanesborough Hotel, Rick Stein of Padstow’s ‘The Seafood’ Restaurant and Seiji Yamamoto of Nihonryori Ryugin (a three Michelin starred restaurant in Tokyo), local son and chef Nguyen Nhu Thinh has returned home to create a fresh new venue with global flavors. Like many of his mentors from two-star and three-star Michelin restaurants in London and Tokyo, Chef Thinh is a perfectionist when it comes to cooking and it truly shows in the consistency, quality and attention to details in each dish. We have never tasted anything that we did not go ‘Whoa’ at Aubergine. And to top that, every time we get so familiar with all of the food on the menu, Thinh changes everything up and introduces his new creations (which is rare in Hoi An as most restaurants cater only to tourists and thus never change their menu). As good friends with Thinh and his lovely girlfriend Kate, we are also lucky to enjoy the luxury of getting surprise dishes off menu, and oh my, aren’t they all great. To be honest, if I can trade one of my kidneys for his cooking talent, I would! No words could describe Aubergine49 as vividly as the experience of dining there yourself. Our guests are always happy with the recommendations as they say they get the best meal at a fraction of the price they would pay back home in Europe. So here it is, Aubergine49 – our favorite restaurant in Hoi An and we hope you would enjoy it as much as we do too. For any poor souls who may worry about finding their way from Cua Dai Beach to Heron House, we wanted to provide a brief instructional video on the 2 km ride by scooter to our little slice of heaven. Hope you enjoy and remember that our staff are always happy to come find you if you should make a wrong turn in the rice fields! Peace out, time to return to the beach!